We visit various Italian cities and interesting spots in the company of Arianna and other Yabla friends. Arianna takes us around Florence. In this part, we walk from the main train station to the famous San Lorenzo market, where it's time to find some lunch. Arianna shows us the outside market near San Lorenzo, and we discover where the train station got its long name Santa Maria Novella. 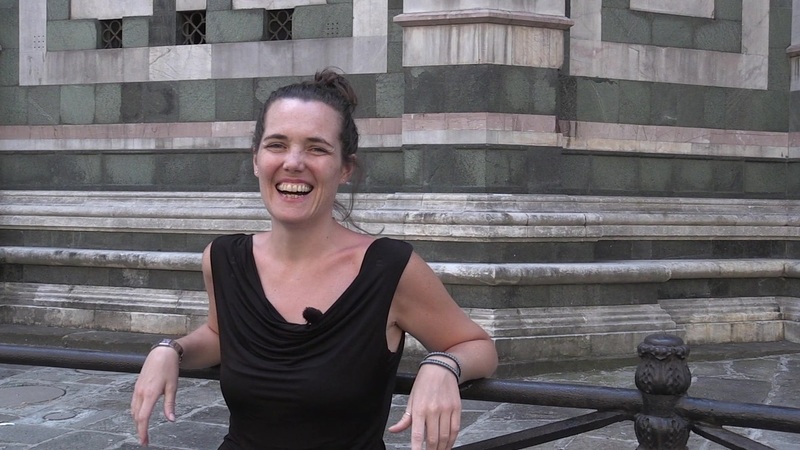 Arianna also gives us some important information about how to get to and from the airports of Pisa and Florence. Today Arianna takes us back to Florence. This time we go to a high point on the southern side of the Arno river where we get a view of the whole city in all its splendor. Arianna takes us down to one of the most popular and busiest parts of the city. Many areas are primarily zone pedonali (pedestrian areas) but you still have to be very careful. Gianni takes us up to an abandoned villa, and reflects on the tremendous challenges the builder faced. Gianni explores the interior of the abandoned villa, imagining what it might have been like before. Arianna shows us around the Cathedral Square, where the bell tower, better known as the Leaning Tower of Pisa, is located. This beautiful church is worth a stop on the way from Pisa to the seaside. Arianna shares her discovery of it. The ceramic bowls that decorate the church are technically known as “bacini ceramici” in Italian, which could be translated as “ceramic basins.” Art historians who write in English, however, also use the term “bacini” for these tin-glazed works. Arianna takes us down to a beach near Pisa, and explains a bit about how beaches work in many parts of Italy. Arianna visits Lucca for the first time, and gets some advice from a friend who lives there. Arianna and Eleonora look at the map together to get an idea of how the city is laid out. With its Roman origins, Lucca's urban space was designed with intersecting roads called 'cardos' and 'decumani'. Mini decides to guide Arianna through one of the main roads of Lucca to the center of the city. It's one continuous road but its name changes several times. Arianna is fascinated by some mysterious numbers appearing on the stones of the pavement.